During assembly, each WLA was fitted with specially designed equipment for military use. A Tool Roll, Spare Parts Kit and various Manuals were provided with each motorcycle. On this type II Factory photo; note the windshield apron, the leg shields, skid plate, luggage carrier and the brand new tan leather saddle bags. The rear view mirror mounted on the far side of the handlebars is hidden by the leatherette windshield apron. The M1940 Submachine Gun scabbard (or other carrier) was a Quartermaster item and was supplied in the vehicle's unit. 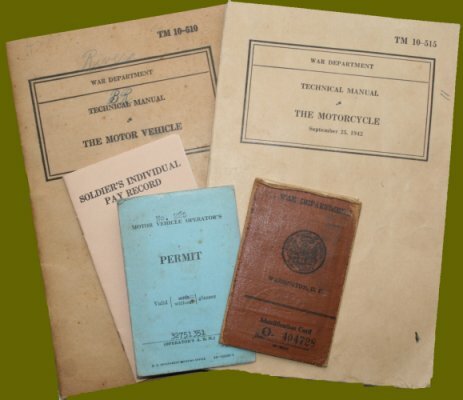 It is not quite clear which Technical Manuals (TM) were provided with each WLA, but most probably each motorcycle would have been issued with at least two publications listed on the motorcycle's data plate. Below are original manuals from the webmaster's collection. TM 9-879 (left), dated 18 October 1943, contains a description of the motorcycle and technical information required for the identification, use and care of the vehicle. Basically it's a guide for personnel charged with operation, maintenance and minor repairs and was issued with Type VI and VII 42WLAs. 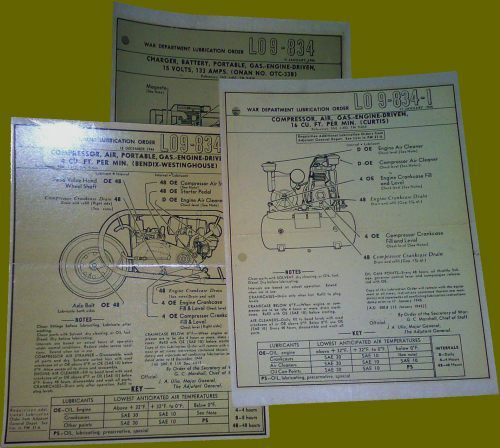 TM 10-1175 (middle) contains specific information about engine and gearbox maintenance and overhaul of motorcycles built under Contract Numbers W-398-QM-10530 and W-398-QM-11782. 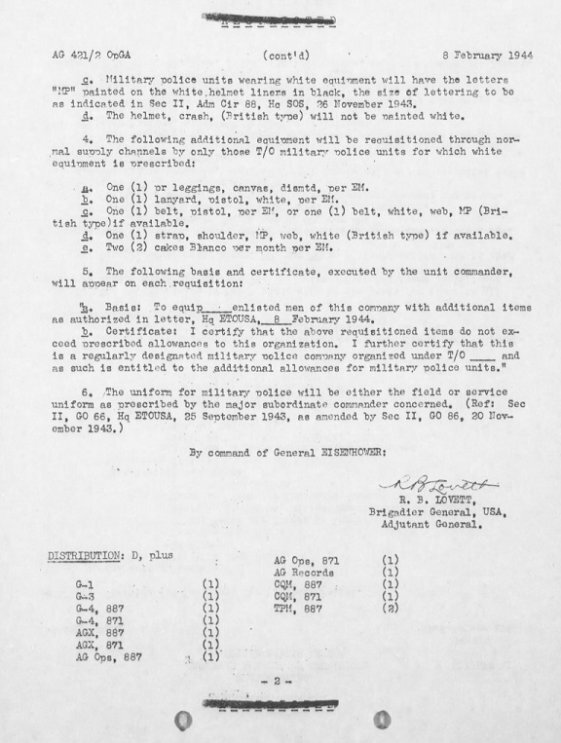 The webmaster's Type III 42WLA31854 was made in this contract. The manual is dated April 1942 and issued with types I thru V.
The SNL G523 (right), dated 15 September 1944, lists all parts and includes all changes to the different types, provided with Type VI and VII. 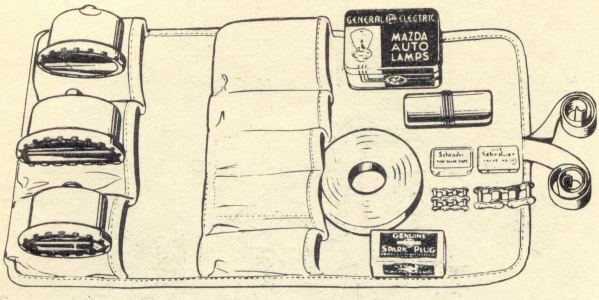 Although lubrication guides were printed in the vehicles' manuals, during the later stage of WW2 a separate guide was issued with each vehicle. Jeep owners will know that it was attached under the hood of the vehicle from late 1944 onwards. 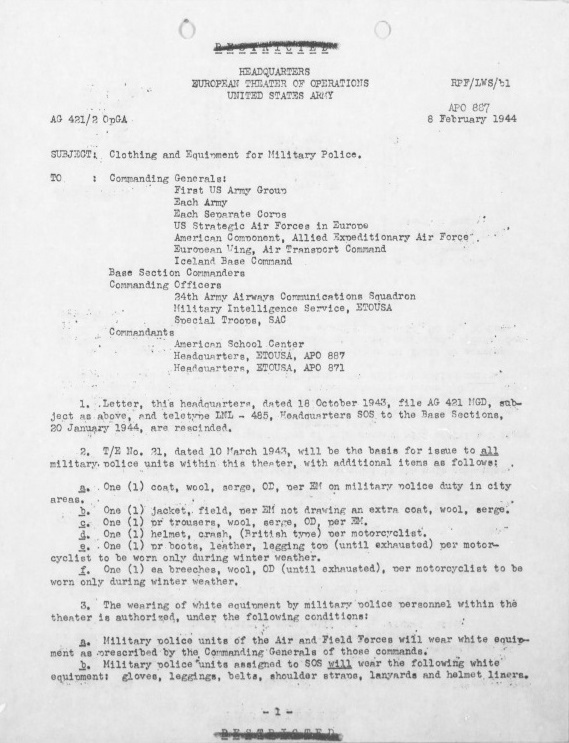 The 15 September 1944 edition of SNL G-523 lists a Lubrication Order to be issued with each bike. The form of this order is not clear but it could have been a decal as issued with other equipment in the later stages of WW2. This decal may have been applied to the oil tank of late production bikes, or it was stuck onto the tank once the bike was sold as surplus after the end of WW2. The picture above shows an official sale of a brandnew WLA in the immediate postwar period. The US Government sold thousands of surplus vehicles thru the DRMO (Defense Reutilization and Marketing Office) where US citizens could obtain original US Government surplus property. The date of the sale above is not known but as Jeep sales have been reported as early as 1947, we can assume the motorcycle sale happened around the same year. The bike, which is obviously a late type and unissued, has a large decal stuck on the oil tank. 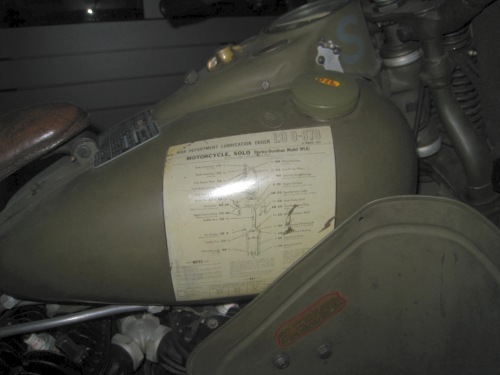 On the photograph it is not clear what the decal is, but the WLA on display in the Harley-Davidson Museum, shown below, has an identical decal stuck to the tank. 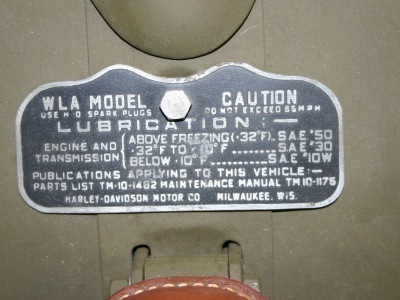 It is a March 15th, 1945 dated Lubrication Order LO 9-879. By late 1944, these decals seem to have been a common thing for different US Army equipment. Lex Schmidt has similar decals in his collection which are shown below. The dimensions of these decals are about 6"3/4 x 8"1/2. 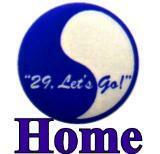 This matches the decal on the WLA in the HD-museum. 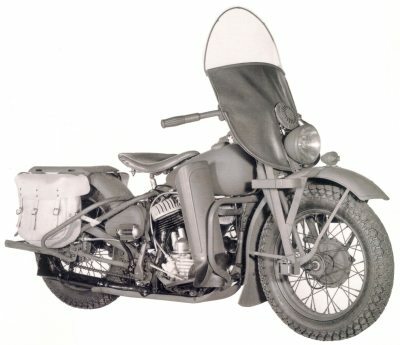 The 42WLA motorcycle was based on existing models and many parts were identical to the ones used on civilian production bikes. Special military parts were designed to withstand rugged Army use. The chart below lists these parts as described in TM9-879 and SNL G523. * The Scabbard, Submachine Gun, M1940 was not issued with the bike from the factory. Most of the Military Equipment listed above can be seen on many wartime pictures of the 42WLA, however the Skid Plate (Part#2810-40M) is usually not visible. This kind of riding, only to be done by the most experienced riders, illustrates the extreme ruggedness of these bikes which were not designed as all-terrain bikes. Here T5 Arthur Peterson rockets out of a pit at Camp Carson, Colorado in 1944. Although the WLA above is clearly a late Type V, Type VI or VII, it sports an early leatherette windshield apron. The absence of the BO Driving Light gives a clear view on the complete windshield as mounted on the WLA. 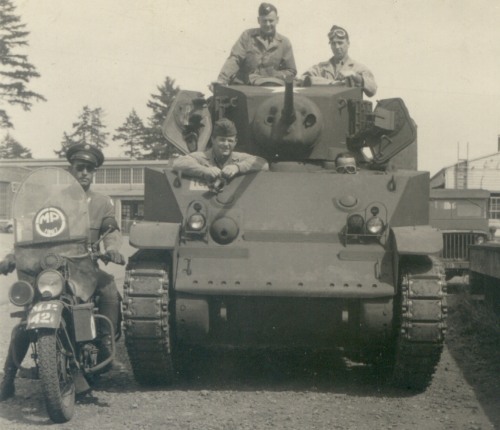 The unit performed Military Police duties in Germany in 1945 and the windshield might have been added for that purpose. Note the missing Ammo Box from its bracket on the front forks. 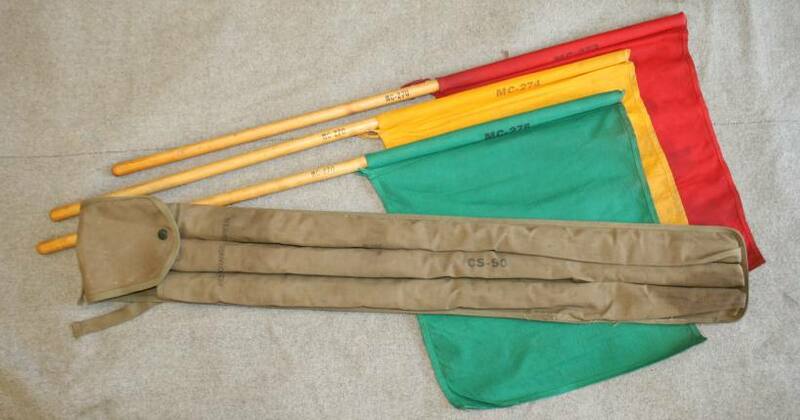 The Windshield Apron was made of Leatherette up to 42WLA42000. From about June 1943, Canvas was used. 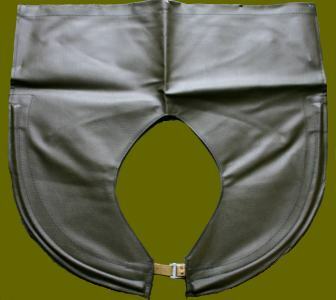 NOS Leatherette Windshield Apron as used on Type I thru Type IV 42WLA. 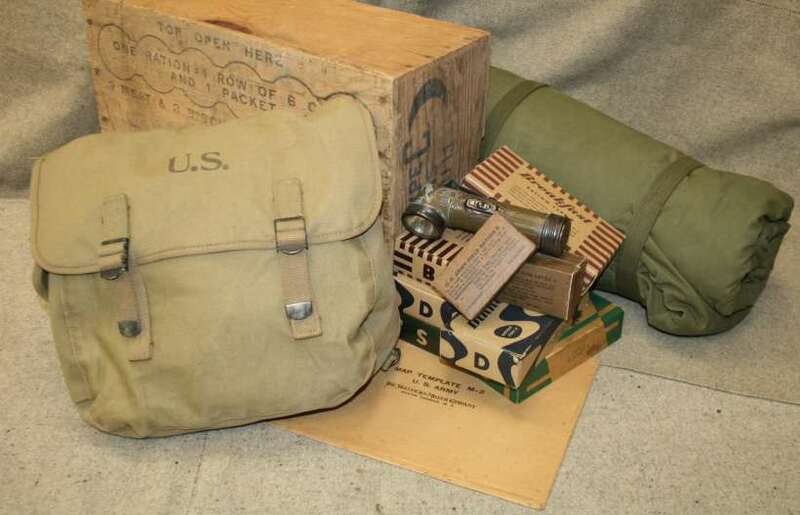 The image on the right shows typical brown paper wrapping and markings for WLA parts during WW2. As war progressed sometimes windshields were adapted or improvised from whatever material available. To accomodate the tall rider, the upper part of the windshield on the WLA above has been enlarged by lengthening the metal frame above the apron. 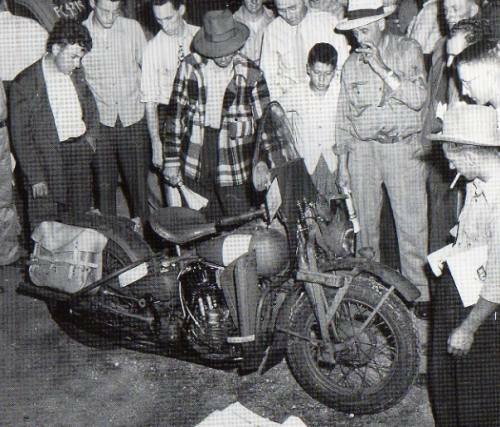 The motorcycle is marked to an 8th Service Command Military Police Unit on the front fender and ammo box. The M5 Tank which seems brand-new, bears no unit insignia. The 8th Service Command comprised units and camps in Arkansas, Louisiana, New Mexico, Oklahoma, and Texas. The Jeep in the background carries markings of a Tank Destroyer unit. The motorcycle does not have a Black Out light, but does carry a large pursuit light on the right front forks. A makeshift black metal shield has been added to the standard solo windshield frame on the WLA above. stationed in Berlin in the summer of 1945. Note how white rimmed pursuit lights have been fitted and even the small marker light's lens has been painted white. A rectangular 'British Style' rear view mirror is attached to the right handlebars. The rider wears a British made motorcycle helmet marked to his function. Leg Shields were packed separately in the wooden transport crate and were not always fitted upon assembly. 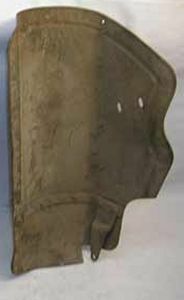 Since legshields were only meant to be used in cold weather, they were generally not mounted or only the bracket was bolted on the frame. 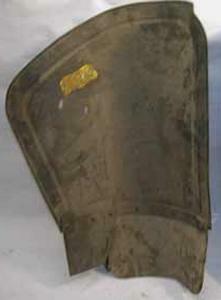 A pair of original unrestored legshields. Note the protection plate on the right shield to avoid contact with the front exhaust pipe. The above decal warned the rider about the dangers of using the legshields in hot weather. It was applied to the right legshield only. The above picture gives a good view of the legshields mounted on a Type V 42WLA. A curved bracket attached to the front frame holds the shield which is bolted at the bottom to the footboard. A set of two saddlebags (Part Number 11786-XM) was supplied with each bike. They were made in both smooth grain and pebble grain brown leather. These bags mount to the special plates on the luggage rack by means of brackets riveted to the bag. Each bag has two tie-back straps on the sides to keep the bags from swinging. The covers are secured with three leather straps with black painted or parkerized steel buckles. A leather re-inforcement was stitched to the back of each bag. The WLC Bags (Part Number 11786-43) are equipped with a large leather pocket sewn inside the bag. Other than that they are similar to the WLA Bags. Original bags in good condition are extremely rare! Each WLA was equipped with a Gun Carrier Rack on the right side of the front forks. Generally the rider carried a Thompson Sub Machine Gun in the M1940 leather scabbard. However all types of weapons could be fitted to the rack, either in the TSMG Scabbard, M1 Carbine or M1938 Rifle Scabbard as illustrated below. 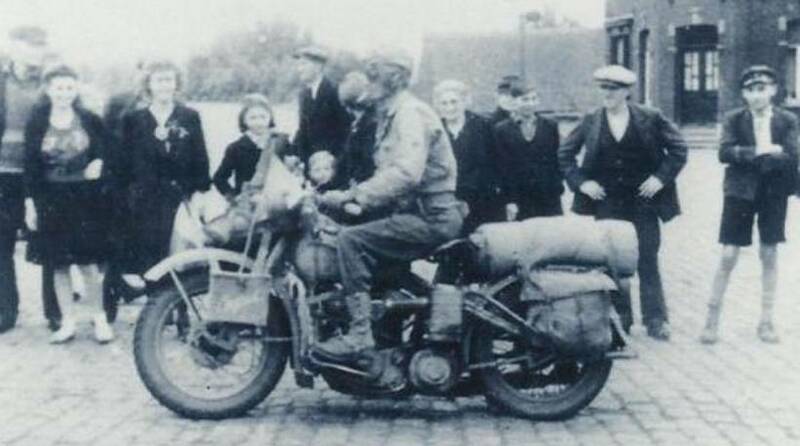 Except for one example observed on a wartime picture, WLC's were never equipped with a Gun Rack or Ammo Box on the front forks. These scabbards were fitted in the unit's motorpool from Quartermaster Department stocks and were not issued with the bike upon delivery from the Harley-Davidson factory. Vehicles and weapons were supplied by the Ordnance Corps. 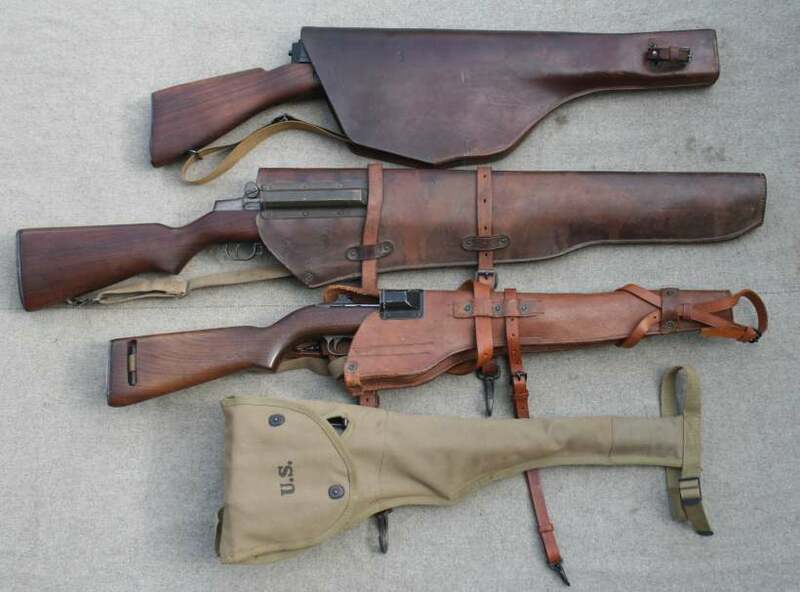 The Milwaukee Saddlery Company (MILSCO), which also made leather seats for Harley-Davidson and many other leather items for the US Army of WW2, was the main supplier of these scabbards; but several other contactors also supplied leather goods. The Thompson Sub Machinegun and M1 Carbine were the most common weapons carried by WLA riders, but some preferred the trusty M1 Rifle (Garand), favored for its accuracy and long range. 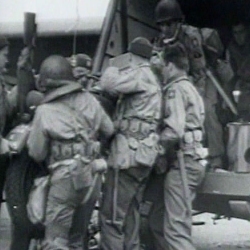 Personnel from Divisional Headquarters of the 82nd Airborne Division load a WLA aboard a WACO glider prior to the Normandy Drop, June 1944. Note the M1 Rifle carried in the M1938 Rifle Scabbard. The headlight glass has been painted over for Black-Out purposes. 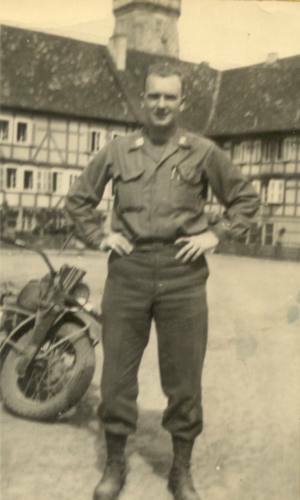 A Captain of Company A, 203rd Engineer Combat Battalion poses in front of a WLA motorcycle in Germany in the spring of 1945. A leather M1938 Scabbard designed for the M1 'Garand' Rifle is carried in the bike's gun rack. The uniform worn by the Officer is the standard wool shirt and trousers, with a pair of Jump Boots. Ranks and Engineer Branch insignia are worn on the shirt collar. At the time of the Normandy Invasion, the 203rd Engineers was part of the 6th Engineer Special Brigade which landed on Omaha Beach. This picture, taken in Ireland in 1942, shows 4 Type II 42WLAs. Thompson Sub Machineguns are carried in leather scabbards, except for the WLA in the foreground where the gun has been put into the bracket without scabbard. The barrel, receiver and Lyman adjustable rear sight of the gun are clearly visible. 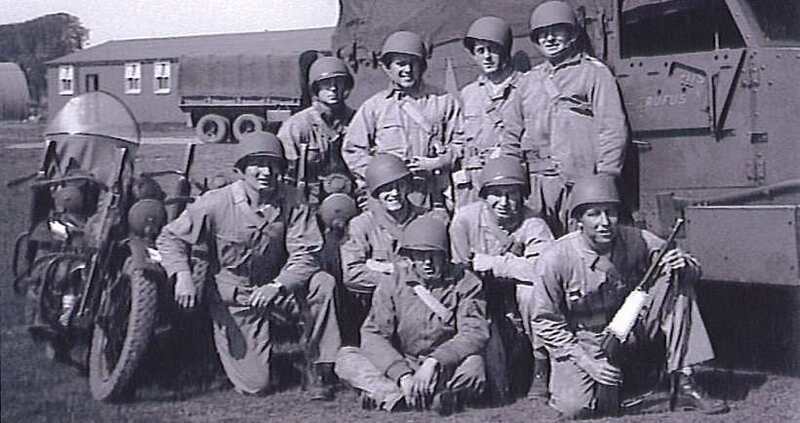 These men of HQ Section, B Company, 13th Armored Regiment, 1st Armored Division 'Old Ironsides' were photographed during training for the invasion of North Africa. T4 James W Mattingly (top row 2nd from right) was a radioman and had 4 brothers in the Division of which one was captured at the Kasserine Pass. All survived the war. They are wearing HBT One Piece Coveralls with early WW2 Gas Mask Bags and two men have the Winter Combat 'Tanker' Jackets. Note the yellow star and other markings on the Half Track, typical for this period! Except for the early types which came with the keyed ignition switch, the 42WLA had no provision to immobilize the bike and prevent theft or unauthorized use. But since the key used on the iginition was the standard H-700 model used for all locks of US Army vehicles of the period (ignition, tool compartments, doors etc...) anyone with a key could start a WLA. Therefore many GIs carried a piece of heavy-duty chain and padlock in the saddlebags to allow secure parking of their ride whenever they had to leave it unattended. The Type III 42WLA on which two GIs pose has had its front wheel locked with a chain going through the spokes and around the fender braces. 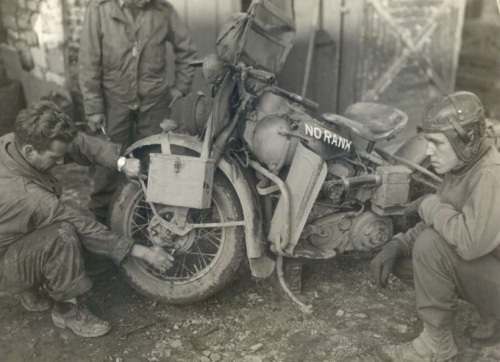 The front fender is marked 2675 over HQ, which shows the bike belongs to the Headquarters of the 2675th Civil Affairs Regiment stationed in Italy at the end of the war in Europe. The absence of weapons and the tan cotton uniforms worn by the soldiers confirm this picture was most probably taken in the summer of 1945. The 2675th Civil Affairs Regiment was the American unit of the Allied Control Commission in Italy. These commissions were established to run the defeated countries until they could govern themselves again. 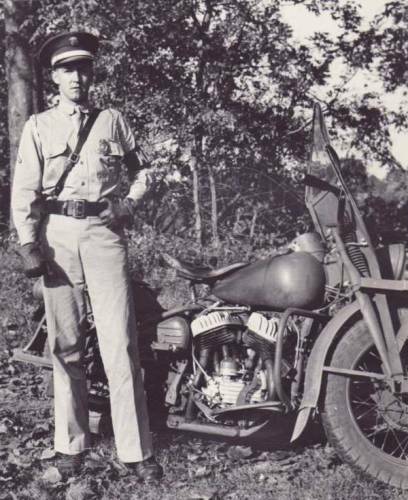 Contrary to popular belief, a tire driven siren was not generally mounted on US Army Military Police motorcycles during WW2. WLAs equipped with a siren were the exception to the rule during the war. On occasion a commercial model was mounted on motorcycles as shown on the picture below. 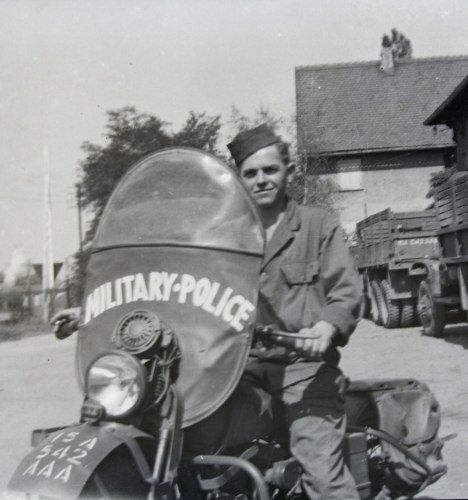 According to the insignia on his uniform, this Pfc posing on a Type III WLA belongs to the Allied Force Headquarters. The AFHQ was the headquarters that controlled all Allied operational forces in the Mediterranean Theater from late 1942 to the end of the war. 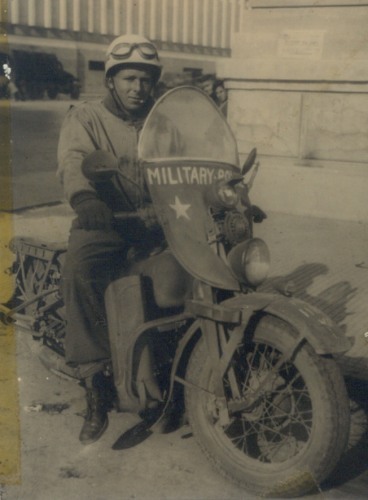 The markings on the bike's front fender further confirm this picture was taken in Italy very late in WW2 or even in the immediate postwar period. The marking is: 'ROME AREA above MTOUSA'. Rome was situated in the US Army's Mediterranean Theater of Operations to which the latter part of the marking refers. Some parts of the bike (i.e. lights, shifter gate, etc...) have been finished in a silvery paint or have been chromed, suggesting the picture was taken at the war's end. Of special interest is the siren mounted on the frame near the rear wheel. 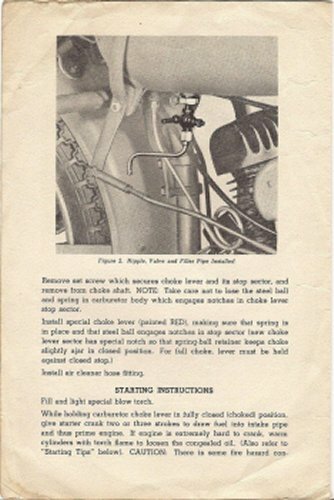 Although a rear tire driven siren is a popular accessory on many restored bikes, it was not commonly mounted on WW2 WLAs. 42WLA Type I thru IV came with the smaller Tool Kit 11800-40A containing only a basic set of tools. From Type V on, the larger Tool Kit 11800-44, containing more tools, was provided. 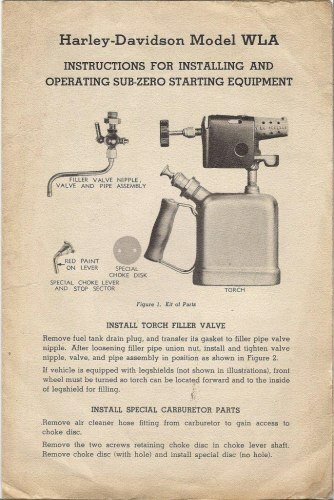 Although not shown in the manual, the tire pump issued with the Type V and later was longer than the one with the earlier tool kit. Harley-Davidson bought its tools mainly from the J.P. Danielson Company Inc of Jamestown, N.Y. and most are unmarked, except for size on the open end wrenches. No doubt as war progressed other makes were included in the tool rolls, either at the factory or in a unit's motorpool. So tools made by Crescent, Vlchek, Williams, Barcalo Buffalo, Irwin, etc... would not be historically incorrect. The table below gives a list of the tools carried in the tool roll, along with the different manufacturers of the tools. The columns on the right show which tools were included in the early and late sets. 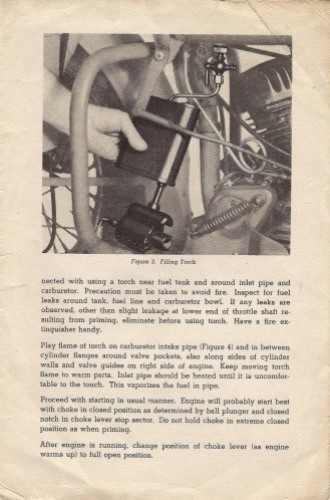 The grease gun in the WLA Tool Kit was made by the Lincoln Engineering Company. It was carried in a separate pouch. 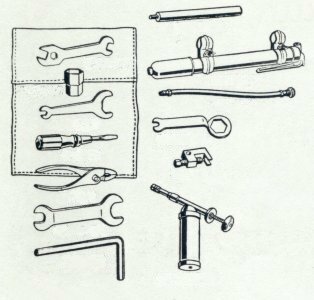 The Instruction Sheet shown above was discovered inside a Lincoln Grease Gun which was part of a complete unissued late type tool kit. The sheet is dated October 1944. Tools were supplied in complete kits, but also available separately. Separately packed Spark Plug Wrench from the webmaster's collection. Note the paper wrapper showing both HD Part # 11929-39 and US Federal Stock # 41-W-3336-310. 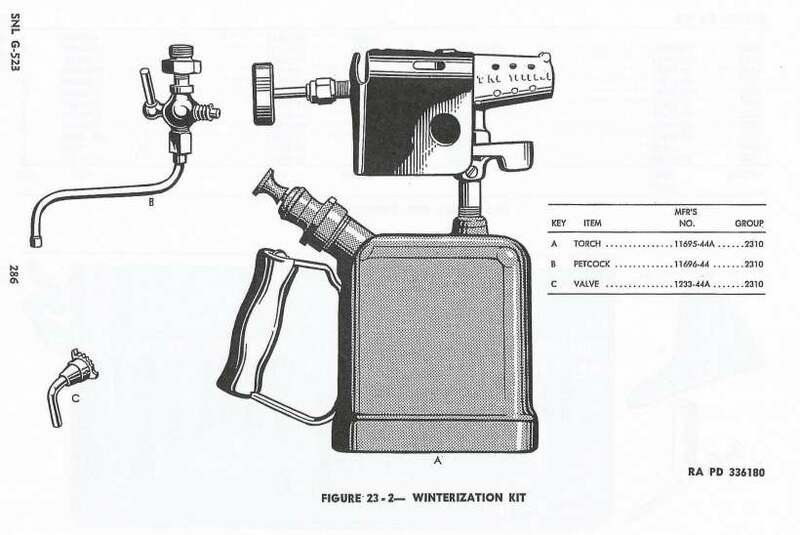 In addition to Tools and Grease Gun, the US Army Ordnance Supply Catalog ORD 7-8-9 G523 dated 15 September 1944 also lists a Winterization Kit (Sub-Zero Starting Equipment) composed of a Blowtorch, Petcock and Tube and Choke Valve and Lever. The make of the Blowtorch (HD Parts Number 11695-44A) is not clear but it is similar to the US Army Signal Corps' TL-130 Torch. 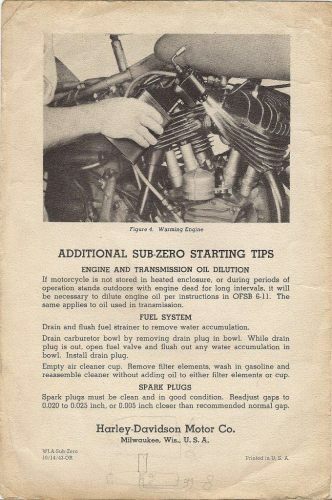 Instructions for Installing and Operating Sub-Zero Starting Equipment dated 14th October 1943. Peter DeSantis served as an MP with the US Marine Corps during WW2. The Type II 42WLA he is sitting on is no longer fitted with the Ammo Box or the TSMG Carrier and also the Skid Plate has been removed. It is equipped with a red pursuit light above the horn and of special interest is the rear wheel driven siren, which is operated by a small pedal mounted on the front chain guard. Although Fire Extinguishers and First Aid Kits were issued with most US Army vehicles, these were not furnished with the WLA. But it seems they were sometimes carried in one of the saddle bags. Here an extinguisher is mounted on the rear fender towards the front of the luggage rack while a First Aid kit is attached to the rack. The box is the early model with hinged cover. Tires on this bike are the Firestone Champion type in 4.00 x 18 size. Another WLA is parked in front of the Pick-Up truck in the background. USMC 42WLAs were obtained from the US Army in their standard configuration. The Spare Parts Roll contained a selection of parts to allow roadside repair. Earlier models only had a Rear Chain Repair Link furnished, but Types V, VI and VII were provided with the kit described below. * Lamp Units from other manufacturers like Corcoran Brown, Arrow, Yankee, etc... would of course also fit. 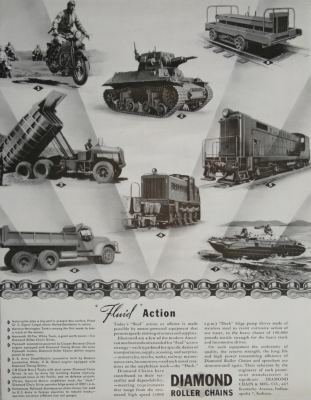 This WW2 ad for Diamond Roller Chains features several vehicles in which Diamond chains are used. Top left shows Harley-Davidson WLA Motorcycles. The Front Chain Repair Link provided in the Spare Parts Kit was supplied by Diamond Chain & Mfr Company. A SSgt from the 10 Engineer Battalion/3rd Infantry Division on a WLA, somewhere in France, February 10th, 1945. The bike looks like a Type III. Although the Ammo Box is missing from the bracket, it is clear the bracket is of the first type. The large tool roll has been attached to the rear safety bars just above the battery box. The pockets holding wrenches and other tools are visible in the center of the roll. The leather saddle bags are rather unuasual and look more like Cavalry Bags. Wide straps (from an M1935 Bedding Roll?) are attached to the luggage rack. These kind of straps were generally used to fasten personal equipment to the bike. Often a rider found himself separated from the other vehicles carrying his extra gear, so messenger took whatever they could with them. Markings are limited to a circled star on the tank. A complete and original Tool Set and Spare Parts Pouch are the ultimate accessories to any restored WLA! 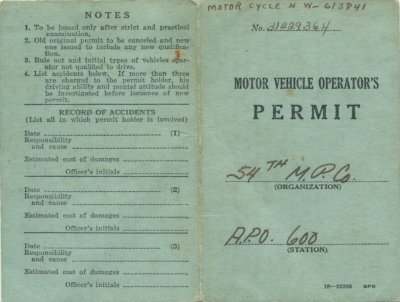 One document required for every vehicle driver was the Motor Vehicle Operator's Permit, proving the GI could operate the vehicle in question. The permit was issued after a drivers' examination and signed by an Officer. 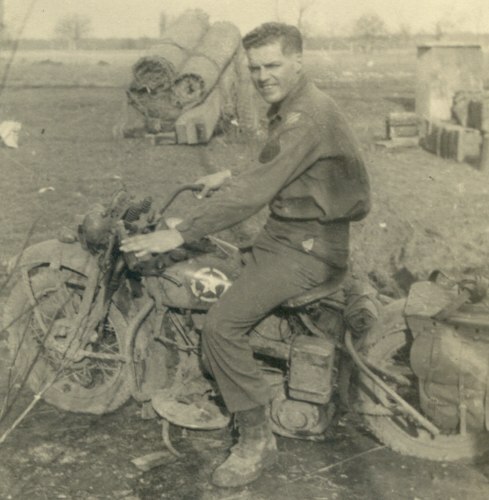 The picture left shows Arthur Cossette on a WLA in Naples, Italy in 1944. 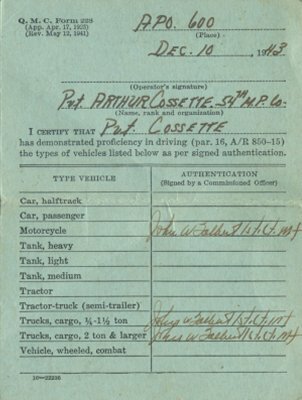 Pvt Cossette was a Military Policeman with the 54th MP Company attached to the US Army's IInd Corps. 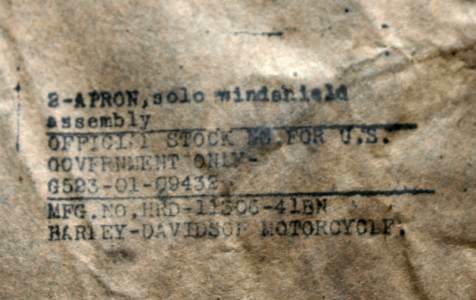 His Driver's Permit shown below lists the bike's USA number as U.S.A. W-613841 which indicates the bike was a Type II. The lack of Black Out Driving light on the left of the headlight seems to confirm this; although a BO-light has been added above the headlight. The markings on the front fender are not clear, but are most probably markings for a IInd Corps unit. Cossette wears the standard wool uniform with a Winter Combat jacket (aka Tankers' Jacket) and 'Airway' type goggles on a white painted helmet liner. Front and rear view of Pvt Cossette's permit. The Motor Vehicle Operator's Permit was kept in the Driver's Manual together with an Accident Report. 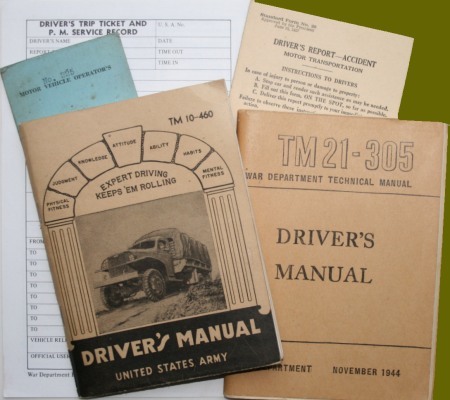 This manual was issued after a soldier had passed the driver's examination and it provided vital information about military drivers' duties and competences. 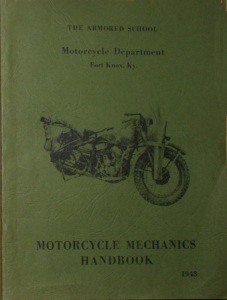 TM 10-460 is the 1942 edition of the Driver's Manual and it was superseded in late 1944 by TM 21-305. Both manuals are shown with a Motor Vehicle Operator's Permit, Form 26 Driver's Accident Report and a Form 46 Driver's Trip Ticket which held all information about a certain itinerary and mission performed by a driver in a specific vehicle. All kinds of Technical or Field Manuals described just about every aspect of soldiering for the WW2 GI. 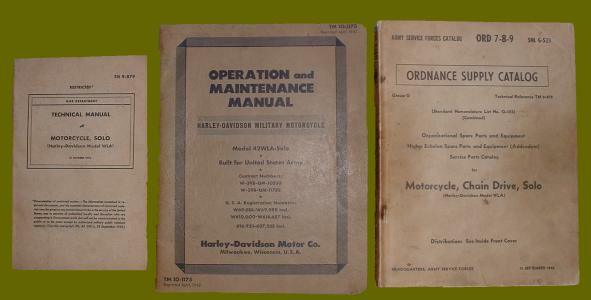 While the 'Motor Vehicle' manual described Army vehicles and their use in general, the manual about 'The Motorcycle' provided the rider with a vast array of information about his motorbike and how to ride and maintain it. 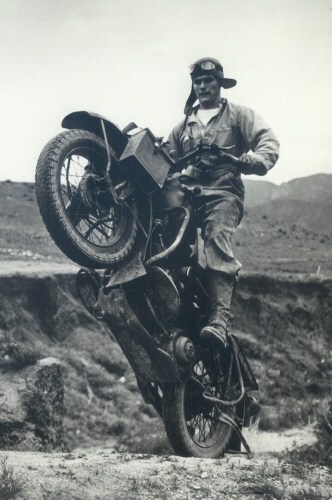 Whatever Dispatch Riders wore depended not only on their unit or rank but also upon their ingenuity; the GI being famous for scrounging around to improve his gear. 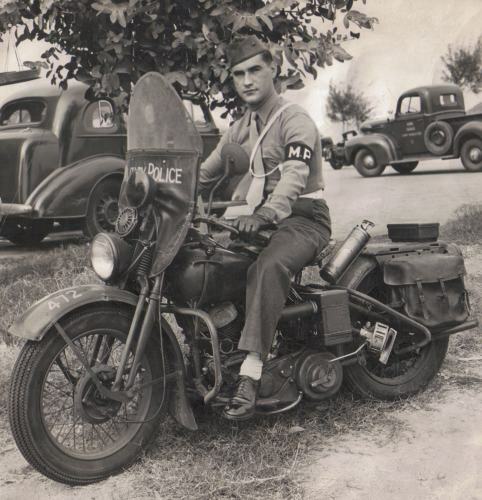 Since no specific garments were designed for the US Army motorcycle rider, a WW2 WLA rider was issued the basic uniform and equipment worn by every US Army serviceman, . At the beginning of the war this was the standard wool uniform, which saw improvements as war progressed, and culminated in the standardized M1943 set. Describing every uniform item worn by WLA riders is beyond the scope of this site, but a comprehensive description of the most common uniforms of the WW2 GI can be found Here! The motor vehicle driver and mechanic award was originally authorized by War Department Circular 248 dated 28 July 1942 as a token of appreciation for the Army driver. 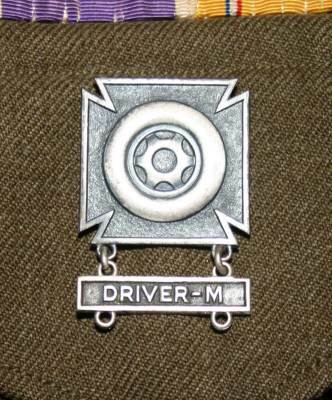 After having attained a high degree of skill in the operation and maintenance of motor vehicles, the operator or mechanic was awarded a badge made of oxidized silver and consisting of a cross patee with the representation of a disk wheel with tire placed in the center thereof. 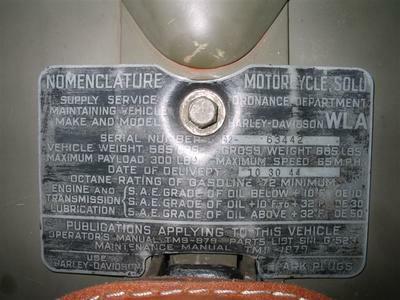 Bars suspended from this badge were marked to show the type of qualification (DRIVER-W for wheeled vehicles, DRIVER-T for track or half-track vehicles, DRIVER-M for motorcycles and MECHANIC for automotive mechanic). This badge was worn on the left breast pocket of the service coat below the line of medals or service ribbons. 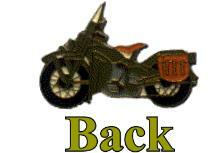 The Motorcycle Driver Award Badge is the only insignia that distinguishes the motorcycle rider from other soldiers. Large leather waist or 'kidney' belts were a popular accessory for motorcyclists of the 1940's... It gave the rider support and protection of the lower back while riding the 'hard tail' motorcycles on bad roads for prolonged periods of time. They were not available from the Quartermaster Corps, but many riders acquired them directly from Harley-Davidson dealerships or other sources. 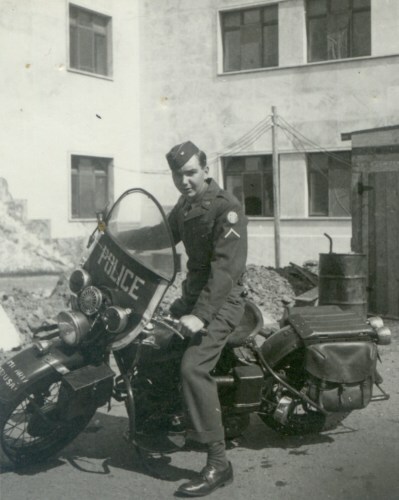 Corporal Chad Conway astride his WLA in the streets of a ruined Berlin in 1945. Conway was a member of the 82nd Airborne Division's Military Police Platoon and one of General Gavin's escorts. The saddle of his bike is covered in fur and the handlebar grips are equipped with leather fringes. The uniform consists of an 'IKE' jacket, wool riding breeches and high leather legging top 'Cavalry' boots. He is armed with a .45 Calibre M1911A1 Pistol, carried in a standard hip holster. Conway tops off his uniform with a leather kidney belt adorned with a painted 'All American' Divisional sign, and both US and captured German insignia. 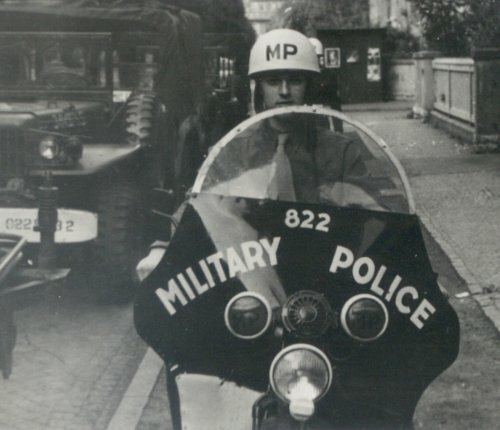 Although the US Army Military Police Corps was officially established on 26th September 1941, its lineage and history traces back to the American Revolution. During WW2 MPs wore uniforms similar to those worn by other branches while special equipment was used to distinguish themselves from other troops and to manifest their authority. Another common piece of MP equipment was the dark blue brassard which was worn on the wearer's left arm attached with a safety pin. Armbands with press studs were introduced after WW2. Although the US Army didn't officially approve a Military Policeman's Badge until 1975, badges of various designs were worn by MPs at different stateside Camps and Forts during WW2. The wearing of these patrolman's badges seems to have been restricted to the Continental US. Below is a picture illustrating the wear of the MP badge during WW2. Standing next to his ride, a Military Policeman poses for a photograph, somewhere in the ZI. (Zone of the Interior i.e. the US). The WLA most probably is a Type II as it is equipped with the bicycle style kick starter pedal, although the parkerised circuit breaker cover could indicate a very early production Type III. The US Army license plate is just visible underneath the rear lights. The summer tan uniform is worn in combination with a wool service hat fitted with a white chinstrap. 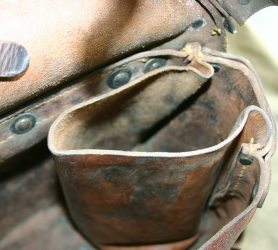 The leather belt is supported by a shoulder strap and probably holds a .45Cal pistol. A Military Policeman's Badge is worn on the left shirt pocket. These badges seem to have only been worn in the Continental US. 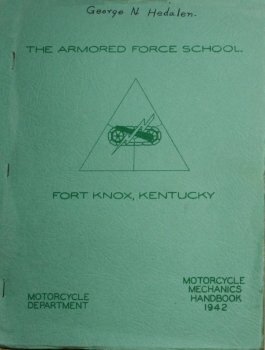 The 1943 edition of the above handbook holds a ‘Stowage List for Army Motorcycles’ which shows items authorized for issue to motorcyclists under the Armored Force’s T/BA No17. The list was approved for both WLA and XA models. It can only serve as a guideline, as it remains unclear if other units or services issued similar lists of equipment. 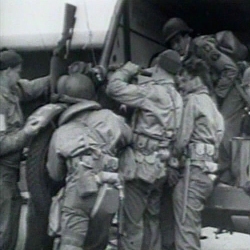 Oddly it is rather uncommon to see equipment fitted to WLA luggage racks in wartime pictures, but occasionally Blanket Rolls can be seen carried on the back of the WLA as described in the list above. 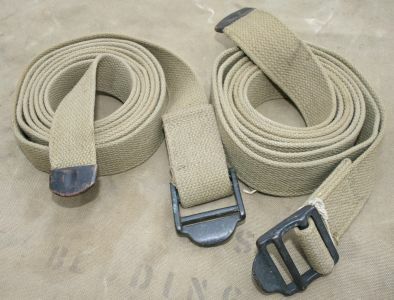 Although any strap or string would have been used to secure equipment, the webbing straps of the M1935 Bedding Roll were especially convenient. These straps, about 7' long and 2" wide, fit through the 4 holes of the luggage rack perfectly and allowed secure fastening of gear. 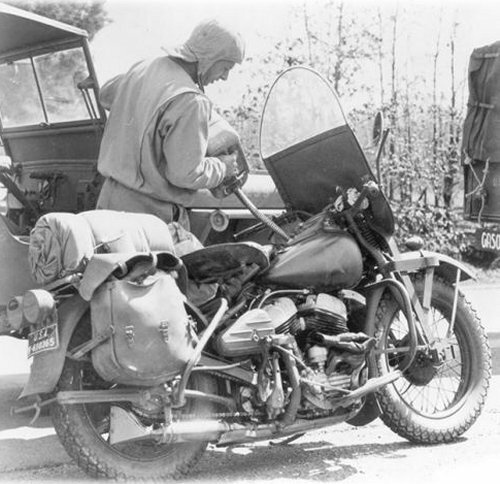 During one of the early WW2 Stateside Manoeuvres, a fully equipped 42WLA is being refueled by its rider. 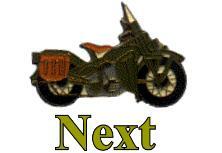 The bike is a Type I, confirmed by the number plate U.S.A. W-610365. The markings on the tank and rear fender tip are barely visible. The GI wears the Winter Combat Uniform commonly associated with the Armored Force. The saddle bags are packed and a blanket roll is strapped to the luggage rack. 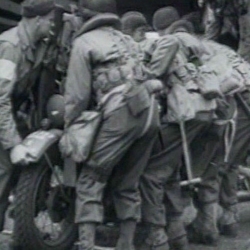 The above picture showing a typical WLA riding GI was taken during the liberation of the Belgian village Houdeng-Goegnies in early September 1944. The region was liberated by the 3rd Armored Division (Spearhead). 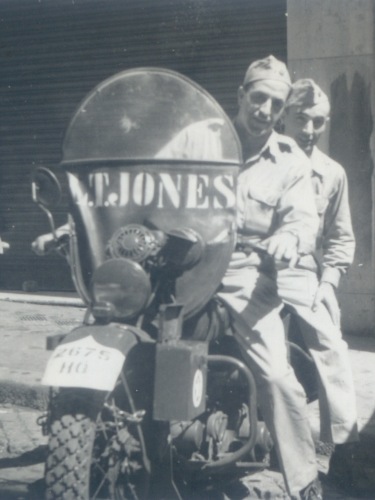 A pennant is carried on the front forks and a nickname has been painted on the Ammo Box. An M1 Carbine is fitted into the gun scabbard. 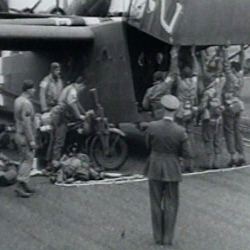 The rider, wearing the typical WW2 Wool Uniform, has packed all of his equipment in the Saddle Bags and has fastened a Bedding Roll on the luggage rack.